One of the most commonly repeated pieces of advice given to freshmen in college is that “everyone is in the same boat” and to not be afraid to “step out of your comfort zone and try new things”. But I’m sure you’ve already heard that. Moving somewhere new and starting college can be a scary process. Being the “newbie”, you are fronted with the large task of making friends and better acquainting yourself with the environment around you. Lucky for you, there is a cheap and easy way to do both those things at once! 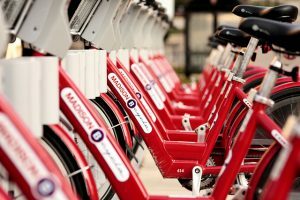 Madison BCycle is a bike system Madison put into place so that people like you could have an easy and accessible way to get around the city. Being new to the school, this is a fun way to explore your new home, even at night! While Madison never fails to keep its citizens entertained during the day, at night time you can still find that same soft hum of busy people enjoying the nightlife. 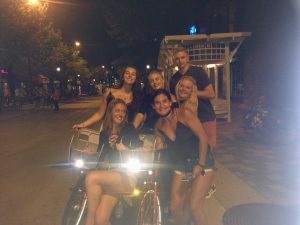 Students enjoying state street with the Madison BCycle bikes on a night out. Every station holds multiple bikes so that there is always one available for people to check out. the city! This way you won’t have to worry about returning the bike on time or finding the station where you picked it up from. You can keep checking the bikes out no matter where you go and get to know your beautiful new city a little better.